Junior infielder Nate Fassnacht swings at a pitch during Wednesday's game against William & Mary. Baseball picked up its fifth win in six games Wednesday in a midweek matchup against William and Mary. 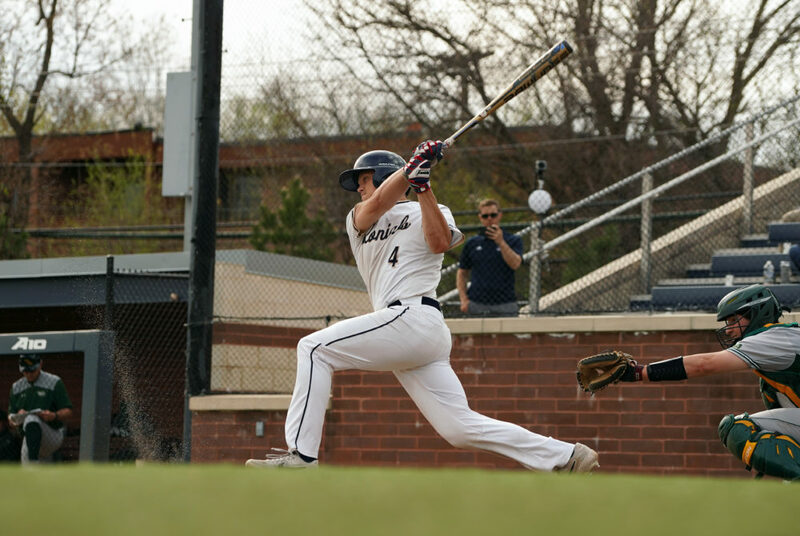 Following a weekend series win against A-10 rival George Mason and a nonconference win against UMBC (14–14) Tuesday night, the Colonials (20–13, 4–5 A10) stayed hot against the Tribe (20–12), notching 11 hits in their 8–4 win. The Colonials batted 0.344 on the night, up from the team’s season average of .305, and the bullpen held the Tribe to a batting average of .188, down from William and Mary’s .254 season average. The Colonials came out firing, stringing together four hits for a three-run first inning. A two-run double by senior first baseman Dom D’Alessandro put the Colonials on the board, scoring freshman center fielder Cade Fergus and junior left fielder Steve Barmakian to get the offense started. A single by sophomore right fielder Tyler Hix later in the first inning scored D’Alessandro, giving the Colonials a 3–0 lead heading into the second. Looking to earn his third win in a row, junior right-handed pitcher Jaret Edwards took the mound for his second start in four days. After a scoreless first inning, Edwards ran into trouble in the second frame, giving up a two-run homer to junior outfielder Brandon Raquet to bring the Tribe within one, 3–2. Edwards settled down on the mound, holding the Tribe scoreless through his remaining two innings of work. The Colonials continued to back Edwards on offense, as freshman catcher Anthony Frechette raked his first home run of the year during the fourth inning to give the Colonials a 4–2 lead. Frechette praised the team’s offense after the game but stressed the importance of strengthening the pitching staff. Senior southpaw Pat Knight, who leads the team with 18 relief appearances on the mound, entered the game for the Colonials in the fifth inning. Knight dominated the Tribe, holding them to just one run over three innings while notching five strikeouts. The Colonials continued to put pressure on the William and Mary offense, putting together a three-run fifth inning to pad their lead. After a walk by Fergus and a Barmakian single, D’Alessandro and Hix were both hit by pitches, forcing in a run to give the Colonials a 5–2 lead. A single later in the fifth inning by redshirt freshman infielder Derek Ripp and a bases-loaded walk by freshman third baseman Logan Doran plated two more runs for the Colonials, giving the team a 7–2 advantage heading into the sixth. The Tribe tacked on one more run in the top of the sixth inning, but the Colonials answered back in the seventh, loading the bases on two walks and another single by Ripp. A balk by the Tribe forced in another run for the Colonials, extending their lead 8–3. Junior right-handed pitcher Andrew Wheeler made his 17th appearance of the season in the eighth inning for the Colonials. After pitching a scoreless eighth, Wheeler loaded the bases with one out in the ninth inning and issued a walk to cut GW’s lead down 8–4. Following the walk, Wheeler was pulled from the game and replaced by sophomore right-handed pitcher Kevin Sylvestri, who escaped the jam with a flyout and strikeout to seal the victory for GW. Ritchie said for the team to find success in its five remaining A-10 series this season, GW will need to take quality at-bats, reduce the number of walks dished out by the pitching staff and continue to work together on all sides of the ball. The Colonials travel to Amherst for a three-game series against conference rival Massachusetts this weekend. First pitch is slated for Friday at 3 p.m.